If you have been less than overwhelmed with federally funded projects to stimulate the economy—like the new electronic signs near Salt Lake City freeway onramps indicating how long it will take to get to Draper— you are not alone. Utah’s newest U.S. Congressman, Jason Chaffetz, R-Utah, says the country was misled. On July 8, Chaffetz used his seat on a House oversight committee to chide administration officials about where all the jobs were. The congressman agrees a federal cash infusion was needed for some benefit programs. But he argues much of the massive spending will end up hurting recovery. Left to its own devices, the U.S. economy “naturally will come back to some degree,” he says. But that will be more difficult if the country is saddled with debt. According to federal officials and experts who testified at the July 8 committee hearing, Chaffetz is right about the lack of job creation so far. But that’s partly because most of the stimulus money hasn’t been spent yet. A private Seattle firm that is attempting to track stimulus spending told the oversight committee that less than 15 percent of available stimulus money so far has been awarded to contractors who will do the work. Mike Mower, stimulus czar with Utah’s planning and budget office, says that Utah has drawn stimulus money for education, road building and a $10 million program to help homebuyers make down payments. But Utah is still waiting for promised stimulus money in areas like energy-efficiency and broadband communications infrastructure. “The real challenge has been managing expectations,” says Mower. Many Utah communities wanted to use stimulus money to build ballparks, thinking the American Recovery and Reinvestment Act was a repeat of Depression-era make-work programs, Mower said. Instead, most stimulus funding is coming by way of increased federal funding for longstanding programs, such as Medicaid. A new report by investigators working for the U.S. Congress finds the rollout of stimulus funds has happened slower than expected, in part because of bureaucratic delay. Salt Lake County has readied plans for spending its share of stimulus money—from solar panels on county buildings to stream restoration—but the county didn’t receive its first federal installment until July 9. The county has received “Homeless Prevention” stimulus money that will be spread through several aid agencies. It also has received stimulus money for street improvements, which are now slated to begin in October. At City Weekly press time, the county is still waiting for money it has been allotted through a stimulus energy-efficiency program to pay for projects like the proposed solar panels. “The [federal] Department of Energy has been overwhelmed” by applications for the brand-new program, said Ann Ober, who is handling the stimulus for Salt Lake County. The county doesn’t anticipate receiving the energy grants for several more weeks. Salt Lake City anticipates eventually spending at least $25 million in stimulus money. But for now, just one stimulusrelated project has begun using money earmarked for the city: $9 million of construction at the airport to install a new runway airplane de-icing system. Most of the stimulus money that Salt Lake City knows it’s receiving will be spent in the 2010 budget cycle, which began July 1. Mayor Ralph Becker has been among a group of mayors advising the Obama administration on stimulus spending. Ben McAdams, Becker’s stimulus point man, defends the spending against the charge that it hasn’t helped employment. Just look at the Salt Lake City Police Department, he says. Before the stimulus came along, Salt Lake City was looking to fire 11 police officers to trim the budget. A community- oriented policing services (COPS) grant funded by the recovery act should save the positions. “In our opinion, [the stimulus] has been a huge success,” McAdams says. Still, Salt Lake City hasn’t seen the COPS money yet. While the city automatically gets a chunk of stimulus money based on its size, it must compete for the COPS money. McAdams says Salt Lake City has been getting positive feedback about its chances—the city included part of the hoped for $2 million grant in next year’s budget— but a decision hasn’t been made in Washington, D.C. In the end, getting to the jobs-creating part of the stimulus might just require a little patience. In Utah, hundreds of millions of dollars worth of construction projects are now being advertised. 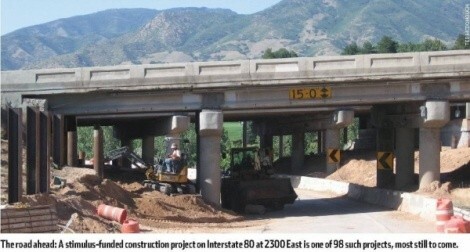 Utah has received all of its more than $200 million stimulus allotment for highway, road and bridge projects, and the state Department of Transportation has advertised for construction bids on all but a handful of 98 projects. Nearly all road projects are slated to get underway this summer. Overall, Utah has been approved to spend more than $1.6 billion of stimulus money. The state has been authorized to put $584 million of that into the spending pipeline, potentially creating 32,000 Utah jobs, according to Onvia, a Seattle firm that has been tracking stimulus spending for government contractors. And the biggest stimulus for the Beehive State could come from elsewhere— via military facilities and federal lands in the Beehive State. In addition to planned spending by state and municipal governments, Onvia has tracked hundreds of millions of dollars’ worth of planned stimulus spending in Utah by federal agencies. That includes $100 million for cleanup of uranium mill tailings in Moab, trails throughout Bureau of Land Management land, and a $25 million EPA cleanup at Eureka. Right now, the Website run by Onvia, a private company, is the only way to track in detail what is going on with the stimulus money. That’s another of Congressman Chaffetz’s peeves. If you want know how federal stimulus dollars are being spent in Utah, there are lots of government Websites to choose from. Unfortunately, there isn’t a lot of information. When Congress passed the $787 billion American Recovery and Reinvestment Act, President Obama promised the spending would be the most transparent in history. The federal dollars came with strings requiring reports to the public and mechanisms to ferret out waste, fraud and abuse. But six months into the plan, it’s still hard for Joe Q. Public to figure out where the money has gone. For that matter, it’s hard for state and city officials trying to work stimulus funds into their budgets. It’s even hard for the U.S. Congress. Right now, the only federal Website that lists detailed stimulus expenditures is operated by a private Seattle company, Onvia, which is in the business of peddling information to government contractors. Because the U.S. government’s own stimulus site Recovery.gov is so bad, Chaffetz alleges that the top users of the Onvia’s site are federal government employees. Onvia’s Recovery.org lists, by state, contracts put out for bid with stimulus money. In contrast, the U.S. government’s stimulus Website, Recovery.gov, charts only how much has been spent by various federal departments and how much has been promised to states. There is lots of information about what stimulus money is supposed to do, but few particulars. In Utah, the state, Salt Lake County and Salt Lake City all have stimulus Web pages, with varying amounts of information. The Utah state site (Recovery.Utah.gov) showcases letters that Gov. Jon Huntsman Jr. was required to write assuring the federal government that stimulus money will be spent appropriately. But there is little information on how stimulus money has actually has been spent. That’s partly because Utah and other state governments are just now receiving federal guidance on how to report stimulus spending and jobs created under the American Recovery and Reinvestment Act, says Mike Mower, who is heading the stimulus tracking effort in Gov. Jon Huntsman’s budget office. Additionally, while Congress required states to account for stimulus dollars, it hasn’t yet given states any of the billions of dollars appropriated for the auditing task. The first state reports on how recovery money has been spent are due to the federal government in October. Utah will put the information on its own Website around that time. In the meantime, Utahns can try to track stimulus spending using the new state Website Transparent.Utah.gov. The Website lists all state spending by Utah. It does not currently identify what projects are funded with recovery money, but may do so in the future. The Utah Department of Transportation’s stimulus Website (UDOT.Utah.gov/arra) may be the most informative. It features an interactive map of all highway road and bridge projects funded with stimulus dollars. Salt Lake County’s stimulus Website (Recovery.SLCo.org) currently reports only the total amount of money the county has been informed it will receive broken down into several program categories. County officials are tracking funding for individual projects and intend to update the Website. Salt Lake City’s stimulus Website (ci.slc.ut.us/recovery), is the most informative when it comes to finding particular stimulus projects. The site breaks out individual projects that have been funded to date—from street reconstruction to $7 million of improvements at a wastewater-treatment plant. The site additionally lists the stimulus-grant money that Salt Lake City has applied for but not yet received. Lastly, the city Website includes an overview of anticipated stimulus spending for all of Utah. Congress recently appropriated $18 million to create a “2.0” version of national Recovery.gov Website to track stimulus projects and jobs created. Current estimates are that the site might be usable by October.